Is BLACKBIRD preparing to challenge COLUMBIA in the Gloucester Schooner Race? 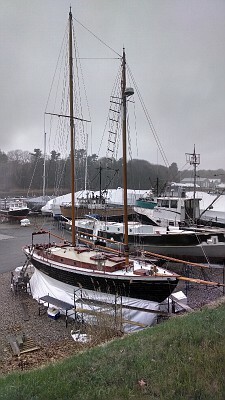 Rainy April weather in Maine stalls work on reconfiguration of schooner underwater keel design. Could this be reminiscent of Alan Bond's 1983 unveiling of Australia II's secret winged keel which when helmed by John Bertrand ultimately wrested Dennis Conner's grip from the Mug? As if the the Race Committee for the Gloucester Schooner Festival doesn't have enough confusion to deal with - given tiny, small, medium, large, extra large, wood, steel, fiberglass, cement, marconi, gaff, bald-headed, stays'l, etc, etc. You had been assigned to the Bird Class to race Bald Eagle and Redbird. Now you will be reassignged to the Black Schooner Class. They could start the red schooners first, then the green ones, followed by white and black. All others go with the closest color.